While the name may remind players of old school computer games there is nothing low tech about the brand new 7Bit Casino. 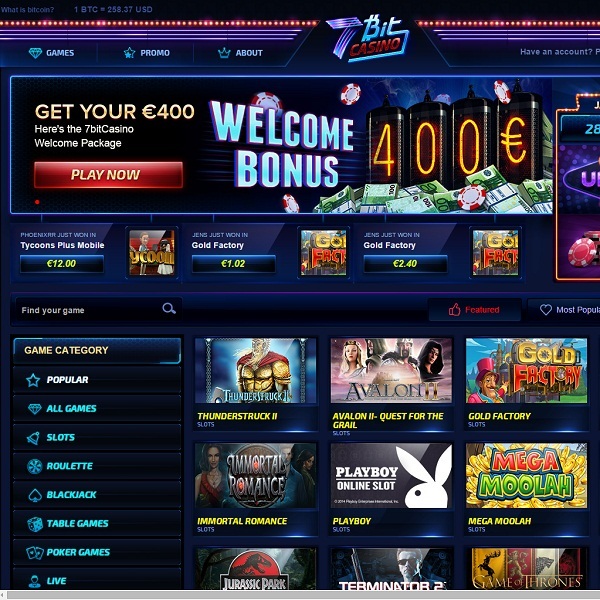 The casino is offering games from some of the top developers such as BetSoft Gaming, Ezugi, Microgaming and SoftSwiss. A number of the games feature fantastic 3D graphics and players are sure to find them extremely immersive. There is a great range on offer including slots, card and table games, poker games and more. Furthermore, the casino is offering members a collection of live dealer games including roulette, blackjack and baccarat. The casino is fairly unusual in that it is accepting bitcoins as well as regular currencies. New members can enjoy a 100% first deposit bonus of up to €200 or 1.5BTC, a 25% second deposit bonus up to €75 or 0.5BTC and a 50% third deposit bonus of up to €125 or 1BTC.